The first Linux Foundation’s Open Networking Summit Europe 2018 was recently held in the Amsterdam RAI Convention Centre. This modern venue was just 10 minutes by train from Schiphol Airport with excellent transport links to the city center via a conveniently located newly opened metro station, as well as frequent buses and trams. The large auditorium, lounges, break-out rooms and exhibitor’s areas were all well-equipped and created an ideal backdrop for keynote presentations, lightning talks, technical sessions, and networking events. The first session I attended was the Women in Networking Lunch. Good food, good conversation, and quick introductions broke the ice. In his opening and keynote address Arpit Joshipura, GM of Networking & Orchestration, The Linux Foundation explained how the power of an open and harmonized community drives innovation and value. The Linux Foundation leads modern networking innovation and currently has 21 open source networking projects. The ‘status quo’ is being challenged and thinking ‘outside the box’ is becoming the new norm, there’s no place for complacency or the fear factor. One example of how these changes and challenges are being handled through collaboration, communication, cross-cultural interactions, knowledge transfer, and diversity were highlighted during the Keynote Panel Discussion – Leading ONAP. 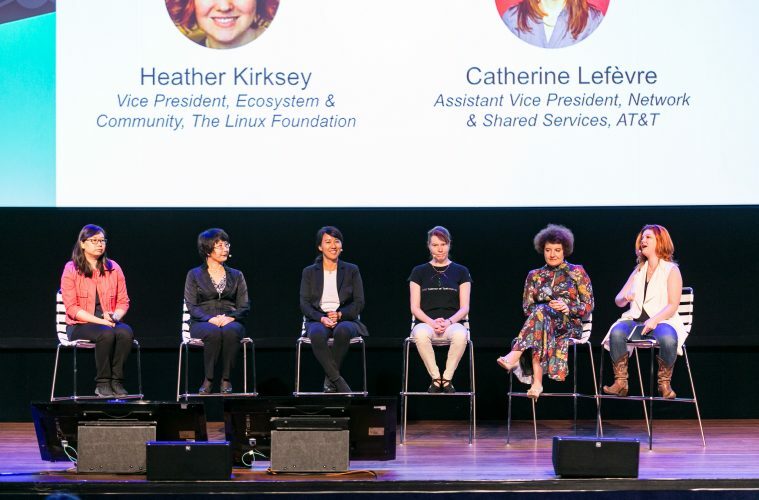 These female leaders who work in different organizations, industries, countries, and cultures collaborate together on The Linux Foundation’s ONAP project. They spoke about their individual contributions and are all highly skilled technical experts. They are excellent role models not only for women and girls but for everyone in the tech industry and open source community. Their commitment, hard work, skills, and dedication to the success of the ONAP project is inspiring. Ideally, Alla would like to see more female developers taking up leadership roles. She suggested this could be done by having more networking events similar to the Women in Networking Lunch held during the summit. Doing this she believed would create more opportunities for women to come together and get excited about the opportunities in the open source community. Speaking about cultural differences, Lingli Deng, China Mobile, explained that people in Asia tend to be more reserved, especially when they come from a technical background. Sometimes it can be hard for them to speak up as they may be afraid of making a technical mistake. Her message was to encourage them to speak up because they are representing their companies and are adding value. It’s a challenge to understand and keep up with the many technical and digital innovations and advances happening today. The importance of collaboration, openness, and diversity I believe are some of the key drivers to success. It’s also vital that more people are encouraged to become developers and to be given the lifelong skills that will enable them to realize and create these new technologies and innovations. The Linux Foundation is the organization of choice for the world’s top developers and companies to build ecosystems that accelerate open technology development and industry adoption. Together with the worldwide open source community, it is solving the hardest technology problems by creating the largest shared technology investment in history. Founded in 2000, The Linux Foundation today provides tools, training, and events to scale any open source project, which together deliver an economic impact not achievable by any one company. More information can be found at www.linuxfoundation.org. * ONAP provides a comprehensive platform for real-time, policy-driven orchestration and automation of physical and virtual network functions that will enable software, network, IT and cloud providers and developers to rapidly automate new services and support complete lifecycle management.